Under normal physiological conditions, the direction of systolic rotation of the left ventricular (LV) base is clockwise, and that of the LV apex is counterclockwise resulting in the wringing motion of the LV around its long axis called as LV twist. The present study was designed to present a patient with significant coronary artery disease in whom near absence of LV twist called as LV rigid body rotation could be induced during dipyridamole stress as assessed noninvasively by three-dimensional speckle-tracking echocardiography. Under normal physiological conditions, the direction of systolic rotation of the left ventricular (LV) base is clockwise, and that of the LV apex is counterclockwise resulting in the wringing motion of the LV around its long axis called as LV twist. Myocardial fibers in subendocardial and subepicardial LV layers are arranged in opposite directions which are responsible for LV twist and are essential for regulating the LV systolic and diastolic functions. Several techniques, including dipyridamole stress echocardiography, have been proposed for risk stratification. Three-dimensional (3D) speckle-tracking echocardiography (3DSTE) is a new clinical tool which enables chamber quantifications in 3D during each phase of a stress protocol. Moreover, quantitative features of LV function including strains and rotational parameters could also be calculated at the same time from the same datasets. Our knowledge is limited regarding changes in LV rotations in normal situations and pathological cases during dipyridamole-induced vasodilation. The present study was designed to present a patient with significant coronary artery disease in whom near absence of LV twist called as LV “rigid body rotation” (LV-RBR) could be induced during dipyridamole stress as assessed noninvasively by 3DSTE. A 78-year-old woman with treated type 2 diabetes mellitus, hypertension, hyperlipidemia, and hypothyroidism is presented. Nine years ago, artificial mechanical aortic valve (Sorin Bicarbon Overline 20 mm) was implanted due to symptomatic significant aortic valve stenosis. At the same time, coronary artery bypass graft operation was also performed due to significant left anterior descending (LAD) coronary artery disease: Left internal mammary artery was anastomosed to the first diagonal branch and the LAD. The patient was on optimal medical treatment and proved to be asymptomatic for several years. However, due to new-onset typical effort angina, control coronary angiography was performed, which found well-functioning grafts, but angiographically borderline right coronary (RC) artery stenoses. Fractional flow reserve proved to be 0.93, 0.87, and 0.85 at different sites, confirming hemodynamic nonsignificance of RC lesions. A routine full-dose transthoracic echocardiographic dipyridamole stress test was also performed in accordance with the recently available guideline. At each phase of stress – at baseline, during low dose (0.56 mg/kg dipyridamole), high dose (0.84 mg/kg dipyridamole) and recovery phases – 3D-echocardiographic databases were also acquired, which were analyzed offline later by an expert in 3DSTE (DP). Toshiba Artida™ echocardiography machine (Toshiba, Tokyo, Japan) was used with a 1–5 MHz matrix phased-array PST-30SBP transducer for 2D studies and 1–4 MHz matrix phased-array PST-25SX transducer for 3D-data acquisitions. Offline 3D-data analysis was performed in accordance with recent practices. During chamber quantifications, 3D Wall Motion Tracking software version 2.7 was used. 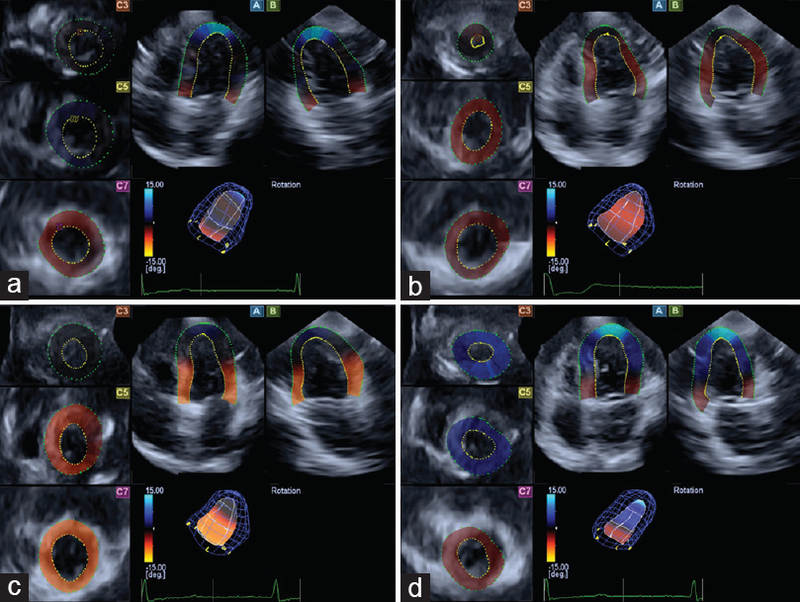 The apical two- (AP2CH) and four-chamber (AP4CH) views and three short-axis views at different LV levels from the LV base to apex were automatically selected from the 3D-echocardiographic pyramidal dataset at end-diastole by the software. Two points of the LV endocardium at the edges of the mitral valve and one at the LV apex were marked manually in the AP2CH and AP4CH views. Then, the 3D-endocardial surface was automatically reconstructed and tracked in 3D space throughout the cardiac cycle [Figure 1]. Manual adjustments were also performed if needed. Apical, midventricular, and basal LV rotations at each phase of the stress were calculated [Figure 2] together with global unidirectional radial, longitudinal, and circumferential and complex area and 3D strains [Table 1]. By visual assessment, no wall motion abnormalities could be detected at any stages of the stress, suggesting a negative stress test result. Both normally oriented counterclockwise apical and clockwise basal LV rotations proved to be reduced at baseline. At the low-dose phase, apical LV rotation became clockwise oriented together with LV basal rotation, demonstrating near absence of LV twist called LV-RBR. At this phase, LV basal rotation became normal in extent. At the high-dose phase, LV apical rotation became significantly reduced but normally counterclockwise oriented again with increased LV basal rotation. At the recovery phase, LV apical rotation further increased with essentially unchanged LV basal rotation. Changes in global strains are presented in [Table 1]. The present case is part of the Motion Analysis of the heart and Great vessels bY three-dimensionAl speckle-tRacking echocardiography during Stress protocols (MAGYAR-Stress) Study, which – among others – aimed to examine the clinical and prognostic significance of 3DSTE-derived parameters during drug-induced stress using standard protocols (“MAGYAR” means “Hungarian” in Hungarian language). Informed consent was obtained from the patient, and the Institution's Human Research Committee approved the study protocol. There is limited information on LV rotational mechanics under normal physiological conditions, even in pathological situations. Moreover, the real prevalence of LV-RBR in different clinical scenarios is not known. Regarding the literature, several studies confirmed LV-RBR in noncompaction, hypertensive, and dilated cardiomyopathies with decreased LV function. Moreover, some reports found LV-RBR in congenital heart diseases and in infiltrative disorders such as cardiac amyloidosis., In a case report, a pair of identical twins was presented to have LV-RBR (clockwise and counterclockwise), the twins had twin-to-twin transfusion syndrome in the past medical history. In addition to these results, two reports have found reversal of LV-RBR. In the first case, reversal of LV-RBR followed 6-month heart failure treatment in a woman with postpartum cardiomyopathy with noncompaction phenotype. In the other report, apical and basal LV rotations were in the same counterclockwise direction, suggesting LV-RBR at rest in a patient with stable angina. During dipyridamole stress at peak hyperemia, basal LV rotation becomes clockwise directed, while apical rotation remained counterclockwise oriented. Following the recovery phase of the stress protocol, all these changes in rotational mechanics returned back to LV-RBR. To the best of authors' knowledge, this is the first time to demonstrate dipyridamole stress-induced LV-RBR. Our patient had a significant LAD stenosis, which could partially explain our finding through steal effect. At the high-dose phase, LV-RBR disappeared due to the (beginning of) normalization of LV apical rotation which could be the consequence of the opening of collateral arteries, which showed improving tendencies during the recovery phase. These findings indicate that strain analysis with 3DSTE may be a useful tool in the assessment of changes in the blood supply of certain myocardial segments and subsequent changes in myocardial mechanics even when no alteration is detected in segmental wall motion by visual assessment. Our results could highlight our attention to our limited knowledge of the behavior of LV rotational mechanics in stress situations. Nakatani S. Left ventricular rotation and twist: Why should we learn? J Cardiovasc Ultrasound 2011;19:1-6. Picano E, Ostojic M, Sicari R, Baroni M, Cortigiani L, Pingitore A. Dipyridamole stress echocardiography: State of the art 1996. EPIC (Echo Persantin International Cooperative) Study Group. Eur Heart J 1997;18 Suppl D: D16-23. Nemes A, Kalapos A, Domsik P, Forster T. Three-dimensional speckle-tracking echocardiography – A further step in non-invasive three-dimensional cardiac imaging. Orv Hetil 2012;153:1570-7.
van Dalen BM, Caliskan K, Soliman OI, Nemes A, Vletter WB, Ten Cate FJ, et al. 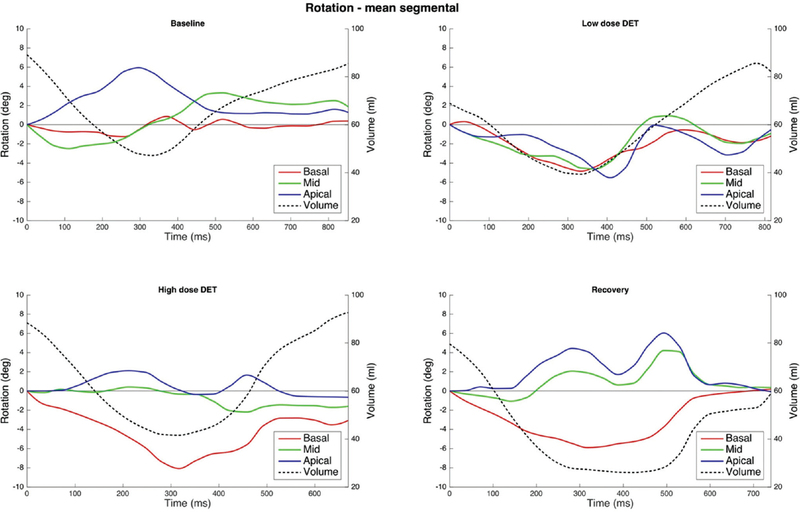 Left ventricular solid body rotation in non-compaction cardiomyopathy: A potential new objective and quantitative functional diagnostic criterion? Eur J Heart Fail 2008;10:1088-93. Maharaj N, Khandheria BK, Peters F, Libhaber E, Essop MR. Time to twist: Marker of systolic dysfunction in Africans with hypertension. Eur Heart J Cardiovasc Imaging 2013;14:358-65. Popescu BA, Beladan CC, Calin A, Muraru D, Deleanu D, Rosca M, et al. Left ventricular remodelling and torsional dynamics in dilated cardiomyopathy: Reversed apical rotation as a marker of disease severity. Eur J Heart Fail 2009;11:945-51. Nemes A, Földeák D, Domsik P, Kalapos A, Sepp R, Borbényi Z, et al. Different patterns of left ventricular rotational mechanics in cardiac amyloidosis-results from the three-dimensional speckle-tracking echocardiographic MAGYAR-Path Study. Quant Imaging Med Surg 2015;5:853-7. Nemes A, Szántó G, Kalapos A, Domsik P, Forster T. Reversal of left ventricular “rigid body rotation” during dipyridamole-induced stress in a patient with stable angina: A case from the three-dimensional speckle tracking echocardiographic MAGYAR-Stress Study. Quant Imaging Med Surg 2016;6:308-11. Nemes A, Katona M, Domsik P, Kalapos A, Forster T. Different patterns of left ventricular “rigid body rotation” in 8-year-old twins with anamnestic twin-to-twin transfusion syndrome (from the MAGYAR-Twin Study). Quant Imaging Med Surg 2017;7:140-1. Peters F, Khandheria BK, dos Santos C, Govender S, Botha F, Essop MR, et al. Peripartum cardiomyopathy associated with left ventricular noncompaction phenotype and reversible rigid body rotation. Circ Heart Fail 2013;6:e62-3.